Prep for my 24hrs with the Women’s Weekly included background checks on all the judges (! ), consultation with my stylist Nicky Heath from Blooming Leopard, hair do but not too done from Richfield Hair and a last minute pedi in the village. CT (my hubby) and I boarded the L90 to the city. We had booked a Wotif hotel room for the night. In the end gutted that I did not spend the $164 instead of the $149! Hotel served its purpose of centrally locating us but nothing more. 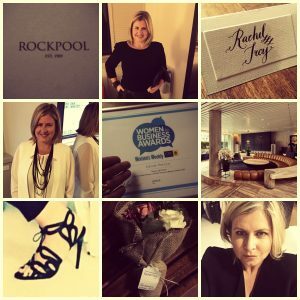 As CT escorted me to Rockpool for the Finalist Dinner he was still thinking he should have been included in the dinner invite. As you’d expect Rockpool was stunning. The service, the food, the company the whole lot. It’s not every day you share desert with Lorna Jane Clarkson. I was tucked in bed by 11pm in anticipation of the next big day at the Ivy Penthouse with our judges/mentors. The Ivy Conference was simply a once in a lifetime opportunity. The morning session was hosted by the The Women’s Weekly Editor, Helen McCabe and CPA’s Alex Malley, The Naked CEO. It was ultimately a round couch discussion and sharing of business nuggets. I was partnered with Jane Huxley from Pandora Music, Carolyn Creswell from Carmen’s and Sasha Drake the Designer. Jane was inspirational, Carolyn directional and Sacha surprisingly candid. Before breaking for lunch the Winner and Highly Commended finalists were announced. It was no cigar this time. But as far as I was concerned I had already won the jackpot. The fun was not over. We all bundled into taxis and headed up town to the magazines studio for the photo shoot. This was equal parts exciting and excruciating. First it was wardrobe. I ended up wearing my own pants and threw on a lovely classic jacket. The big decision really ended up on the heels. Stiletto or funky? Funky won and the pedi decision validated! Then it was hair and makeup. The photographer, Alana worked patiently with each of use to get many many shots. We then regrouped for the Finalist shot. You know the drill cubes, stools all bunched in together…the classic Women’s Weekly shot. Then it was a wrap. I gathered my bits and pieces together, hailed a cab and jumped a ferry. My little family met me at the other end and we had a quiet celebration. I am incredibly grateful for the opportunity to have met these very successful women. It is absolutely not everyday that this happens. A highlight was hearing Pip Marlow from Microsoft recount the story of lady on a plane who told her about GroupPrezzie. That’s when you feel like you’re getting somewhere. So many people obviously have made this all possible (you know who you are x) and you’re all on the boat!